By Erin Bender | November 9, 2018 | This post may contain affiliate links, which means we may receive a small commission, at no cost to you, if you make a purchase through a link. Read our Disclosure. If you thought Canada was all moose, “eh” and maple syrup – think again. There is one road in Canada that will leave you breathless. The 232 km Icefields Parkway is known to be the most scenic drive in Canada. 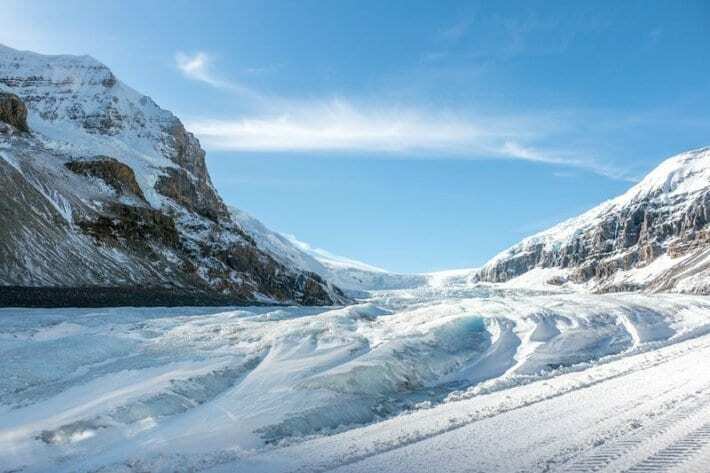 The Canadian Icefields Parkway draws 100,000 vehicles per month with its towering mountains, icy blue lakes and shimmery crystal ancient glaciers. It’s a journey through Banff National Park and Jasper National Park that is quite possibly the most scenic drive on earth and should be on your road trip bucket list. Rated as one of the top drives in the world by Conde Nast Traveller, the Icefields Parkway (Highway 93 North) links Lake Louise to Jasper in Alberta, Canada. The whole drive can be done within 3 hours. A road like this demands your time to explore, to stop, to photograph, to be in awe. 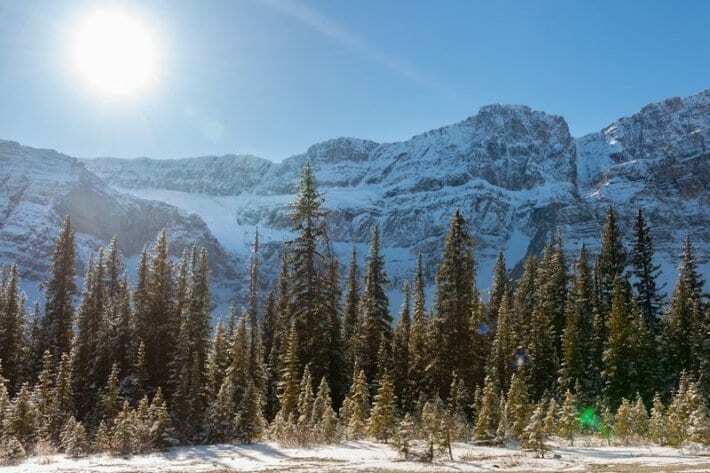 And while there are numerous places for which you will be pulling the car over, here are our top 5 places to stop on the Icefields Parkway from Banff to Jasper. It’s an easy drive from Jasper to the largest icefield in the Rocky Mountains. 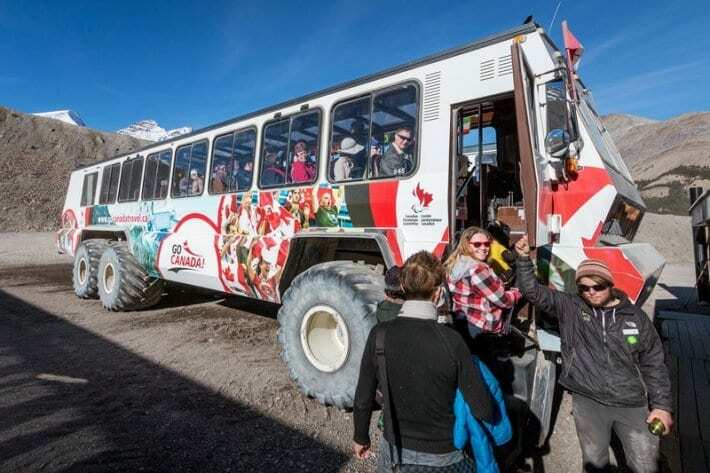 Make sure you park your car at the Columbia Icefield Glacier Discovery Centre and book a tour on the tank-like bus to the Athabasca Glacier. It’s a steep ride down to the glacier, but once parked you have free time to walk around and become an ice explorer. But time is running out. The Athabasca Glacier has lost 60% of its volume in the last 170 years, and experts believe it will be completely gone within 70 years. So make sure you see it while you still can. 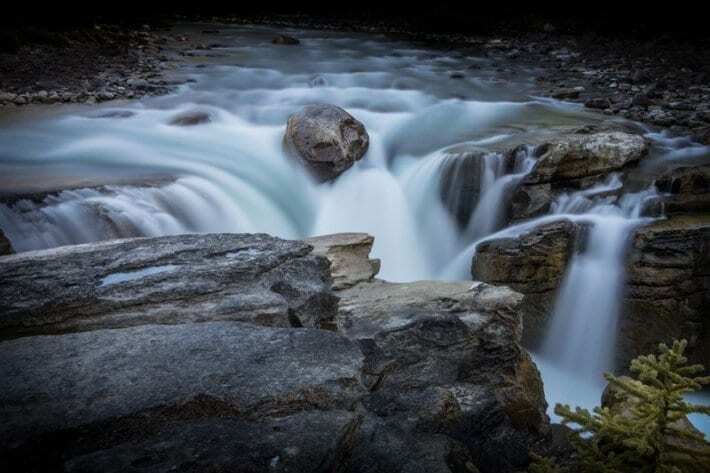 There are two waterfalls along the Icefields Parkway you do not want to miss. A short drive from Jasper is this class 5 waterfall with a drop of 80 feet. Its turquoise sapphire water is spellbinding. The falls are impressive for the volume and force of water, which can be safely viewed and photographed from various viewing platforms and walking trails. With a drop of 61 feet, the Sunwapta Falls consists of an upper and lower fall with a hike that will get you close enough to feel the mist. The falls are particularly impressive in the late spring and early summer when snow pack runoff is high. Lefroy Glacier melts into an impossibly scenic and mirror-smooth lake. Lake Louise One of the most romantic lakes in the Canadian Rockies area to visit, especially during snow season when the white-peaked mountains create a stunning and tranquil landscape. Bow Lake is one of the most underestimated spots on the Icefields Parkway. You will find Bow Lake closer to the southern end at about an altitude of 6,299 feet. Its indescribable beauty is best captured under the setting sun. 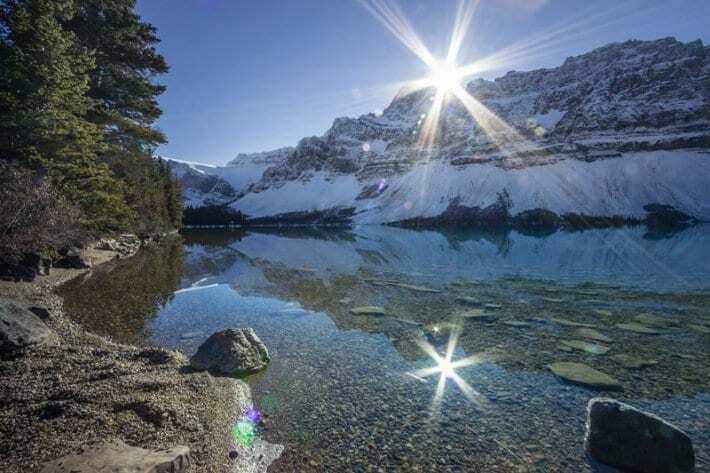 Bow Lake is the headwaters of the Bow River and the perfect spot to view the Crowfoot Glacier, Wapta Icefield, Bow Glacier, Crowfoot Mountain and Mount Thompson. 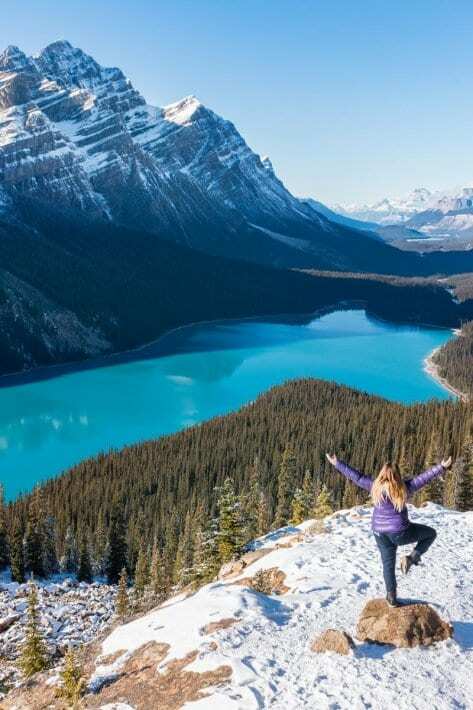 As if a 10-minute hike through a snowy wonderland was not fun enough, when you reach an elevation of 6,102 feet you are rewarded at Bow Summit with the perfect view overlooking Peyto Lake and the sweeping valleys. Bow Summit is the highest point on the drive from Banff to Jasper and is the highest elevation crossed by a public road in Canada. It takes far more than 3 hours to witness all the beauty along the Icefields Parkway, the most scenic drive in Canada. My best tip is to divide and conquer. Stay in Banff and Lake Louise to explore the southern stretch and follow it up with a stay in Jasper for the northern portion. But whichever way you do it, make sure the above 5 stops are at the top of your list. 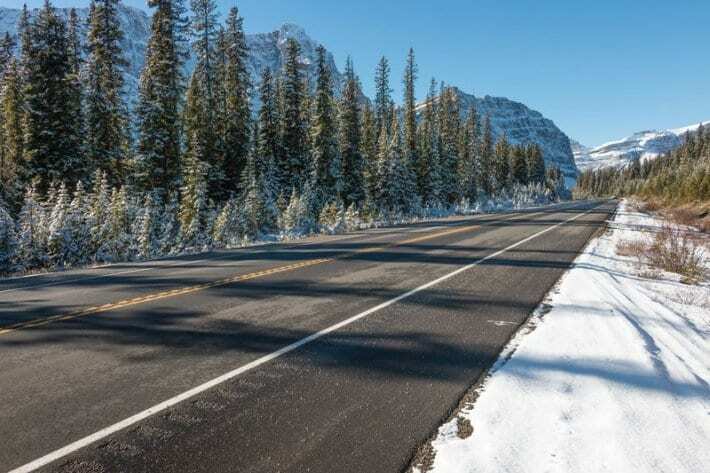 Be sure to check Parks Canada for any closures along the Icefields Parkway. The Mountaineer Lodge in Lake Louise and the Mount Robson Inn in Jasper are popular places to stay. 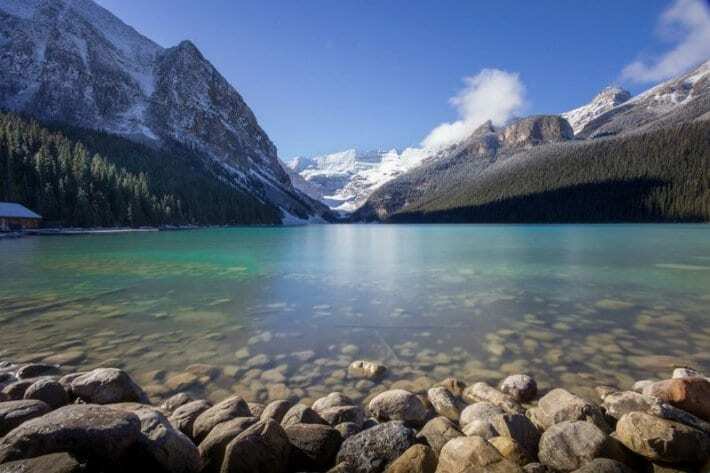 You may wish to explore the Icefields Parkway, Banff and Jasper National Park with an RV. Our partner, Outdoorsy RV Rentals is the #1 Trusted RV Rentals that are low On cost and high on adventure. What helps set them apart is their $1M insurance included. See available RV rentals for the Jasper and Banff area here. Booking.com has over 800 properties in Alberta including hotels, apartments, and guesthouses. You get free cancelation on most rooms and a best price guarantee. Have you driven the Icefields Parkway? What was your favorite memory? Or what is your favorite road trip in Canada? Share in the comments below. Hi Dawn, sorry I am not a travel agent, just a passionate traveller. Thanks so much for sharing our love for Alberta & the Icefields Parkway! Any questions – let me know! I love snowy wonders like this! Looks so beautiful! 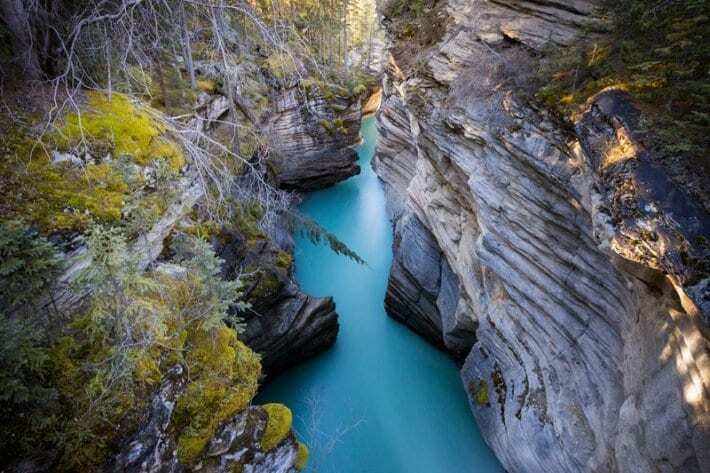 Oh wow, they all look pretty stunning but Athabasca Falls looks particularly amazing. Shhhh they were my favourite too. I love waterfalls. I had the opportunity to make this trip this past summer solo in an RV on my way to Alaska. It has to be one of the most amazing stretches of road on the planet. You’d think that the pictures of the area are photoshopped, but they aren’t. The water is really that color. Totally breathtaking! You are right, it’s the one place on earth that when you get there you weren’t deceived and you see it exactly as it is. We did Alaska to last year! You have describe very well to tour of ice land and lake, and images are very beautiful. 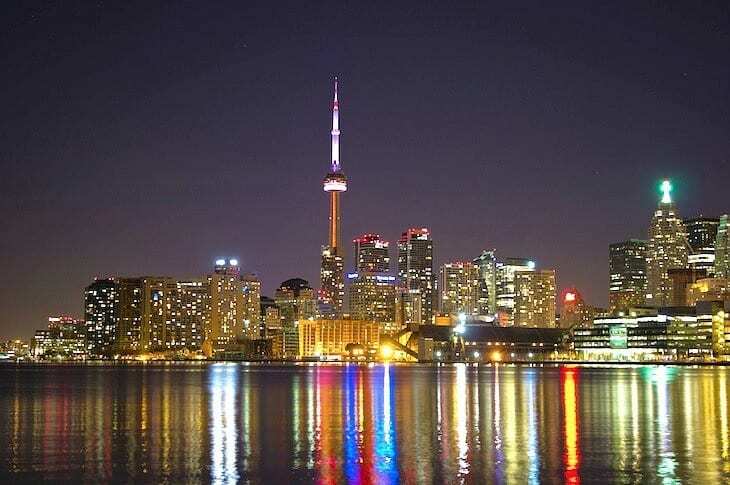 Thanks for share so nice information about Canada tour. Coming soon we’ll be there, we are excited. We go from here in 04 october 2016 from Brazil with our LandRover Defender. Very beautiful! I love snow, and recommend the chile for those interested in knowing the south america. Hello! My best friend and I are planning a trip to Banff this summer and are definitely going to drive the Icefields Parkway. I can’t wait!! Considering that I’ll be there in late August, I’m assuming I don’t need a high clearance vehicle or four-wheel drive? AKA, I’d like to save $$ on renting a car. I’d appreciate your thoughts!! Thanks! Canada is high on my bucket list, Erin! These spots are definitely worth visiting! What time of the year should I visit Canada? 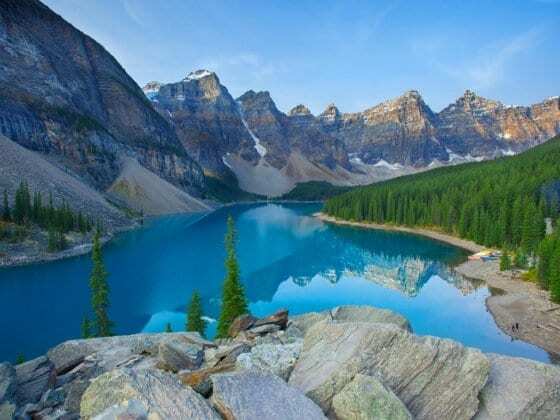 Yeah I have seen Lake Louise and Morain lake and it was amazing. Funny thing is, it wasn’t designed to be scenic. I know because I asked the designer – my uncle Ken.